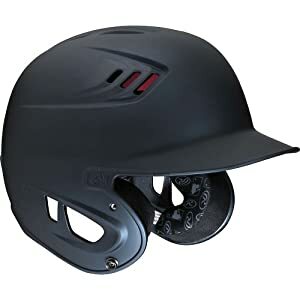 Rawlings 80MPH Performance Rated Matte Batting Helmets Know Your Speed When You Step To The Plate! Rawlings 80MPH Performance Rated Matte Batting Helmets feature: Meets or exceeds NOCSAE standard up to 80 mph baseball pitch speed Rawlings performance rating can be found on the rear of helmet and on the interior crown padding Dual density foam liner for maximum impact absorption and optimal comfort ABS plastic shell One-tone translucent matte paint colors Sizes: Senior (7 1/4-7 3/4) A* Youth (6 1/2-7 1/8) Know Your Competition Level Age 10 & Under 11 - 12 13 - 14 High School College / Pro Fastball Speed 50+ MPG 60+ MPG 70+ MPG 80+ MPG 90+ MPG Be aware of average baseball pitch speeds at your level of play. Note: These are general guidelines and baseball pitch speeds may vary. Rawlings The Mark Of A Pro!